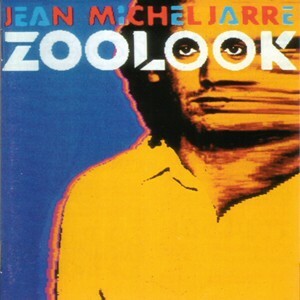 Zoolook is the seventh studio album by French electronic musician and composer Jean Michel Jarre, released in 1984. Jarre became an international sensation with the release of his 1978 album Oxygene, which easily remains his best known work. Throughout the 1980s in particular he was an immensely popular electronic musician, producing works combining synthesizers and electronic samples. As a child I was quite a big fan of his stuff, and owned several albums on cassette tape. They all got left behind many years, however, and it has been years since I have listened to any of his music beyond what appears in the occasional feature film like Peter Weir's Gallipoli. The discovery of some cheap 2014 remasters has tempted me back to see whether or not his works stand up, beginning with Zoolook. This 2014 remaster contains new mixes of both "Ethnicolor" and "Diva" produced by Jarre specifically for the re-release. While admittedly I haven't heard either track since the mid-1990s, they sound pretty much the same to me. Opening number "Ethnicolor" is an 11-minute track broken into a series of movements. It boasts sampled vocal clips before collapsing into a piece hugely reminiscent of Vangelis' work for Blade Runner. From there it segues into a second movement packed with staccato rhythms and a much more distinct mid-1980s sound. The third movement becomes more sweeping and emotive. It sounds incredibly of its time: no one is going to think this album was released any time other than the early to mid-1980s. It is a solid but unexceptional slice of electronica. Strange breath sounds and a faux-seductive female vocalist combine to actually make "Diva" slightly irritating. The slow pace could work, and indeed the more ambient melody that underlies the piece would work wonderfully if it wasn't for the repetitive samples laid on top. Halfway through the entire tone and style of the song changes - sadly not to anything much better, just faster and more percussive. The irritating vocals remain. "Zoolook" opens with some great rhythms and vocal samples. This title track was the album's lead single, and it's easy to see why. It has a simpler melody and a catchy style. By contrast "Wooloomooloo" has a slow, haunting sound to it that is hugely reminiscent of Jarre's iconic album Oxygene. It is a particular strong and engaging track. "Zoolookologie" is a neat match to "Zoolook", and was unsurprisingly the album's second and final single. It has a very mainstream, popular sound to it, as well as a neatly complex series of sounds and samples. "Blah Blah Cafe" has a thumping industrial edge to it that is sabotaged somewhat by a slightly twee, wavering melody. The album ends perhaps a little too abruptly with "Ethnicolor 2", another slow, atmospheric track akin to "Wooloomooloo". Zoolook definitely feels old: the synthesizers and samples have that specific mid-1980s sound that is never going to be shaken loose today. Nor should it. This is a relatively pleasing slice of period electronica. Some tracks irritate for sure, but even the more average of tracks retain a certain retro appeal. I am unsure how often you would want to listen to it these days, but put in its historical context it is fairly decent stuff. Nostalgia certainly takes you a long way with these kinds of recordings. My memory is that the vocals on "Diva" were supplied by Laurie Anderson, which might supply a context for their prominence. Anyway, I have a weird loyalty to this album, if only for it's ability to instantly take me back thirty years to the moment I first heard it. Music is such a powerful time machine, isn't it? Heh. Was logging on to post abut the Laurie Anderson lyrics but Sean beat me to it. From memory, although the sound was VERY 80's it was also VERY cutting edge for the 80s. JMJ tended to always have the latest and greatest "toys" for his sound. I had no idea re: Laurie Anderson. Still a hell of an annoying track. I think it's good that music dates. JMJ's work here sounds so 1980s, but that's no bad thing. It's a specific sound that reminds me of a specific time. Wasn't one of the key things about this album that every sound was a samples human vocal sound? Or am I getting confused with something else?